1) Codes, codes, codes. It’s obviously getting nearer to Christmas because my inbox has been flooded with voucher codes and store coupon deals. Nice one for GAP, here, though, 30% off everything. 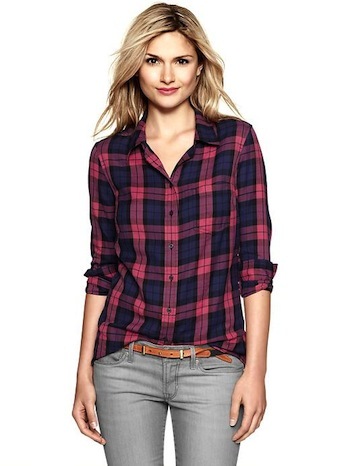 I was going to buy a cool twill white shirt and the flannel one (above) last week but the queue was too long – now I’ve made a little saving! Which is fortunate, because I seem to have been a bit overenthusiastic with the old AMEX card this month. Code is here – you can also get a print-off version from this page to take into store. It runs out on the 19th though – sorry, only just noticed it in my junk mail! 3) Code 3 gets you 20% off your order at Monsoon; offer ends today. Use CHRISTMAS2012 here. Right, that’s enough of codes for today! This post has made me realise that I’ve probably been doing a little too much online shopping. Mind you, I made two orders at ASOS last week and sent everything back because it wasn’t quite right. I thought that was very disciplined of me. Normally I’d keep hold of at least one thing because otherwise I feel as though the whole process has been a waste of time. And that, Dear Readers, is how you end up with something called a “One Day I’ll Wear It” drawer. Previous Post More Merry Minis!